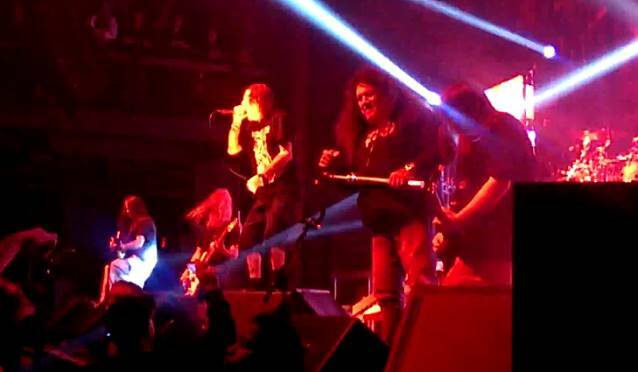 TESTAMENT frontman Chuck Billy joined LAMB OF GOD on stage on November 26 at The Fillmore in Silver Springs, Maryland to perform the song "Redneck". Fan-filmed video footage of his appearance can be seen below. The special 10th-anniversary edition of LAMB OF GOD's "As The Palaces Burn" album has sold around 6,400 copies in the United States in its first week of release to land at position No. 64 on The Billboard 200 chart. "As The Palaces Burn" has shifted more than 270,000 units since its May 2003 release, according to Nielsen SoundScan. "Dark Roots Of Thrash", a DVD/2CD release documenting TESTAMENT's sold-out headlining performance at the Paramount in Huntington, New York this past February, was made available on October 18 (Europe) and October 29 (North America) via Nuclear Blast Records. "Dark Roots Of Thrash" was produced by Get Hammered Productions, directed by Tommy Jones (DEATH ANGEL, KATAKLYSM, SOILWORK) and mixed by Juan Urteaga (VILE, EXODUS, SADUS, MACHINE HEAD).